Are you looking to give your outdoor courtyard a facelift? 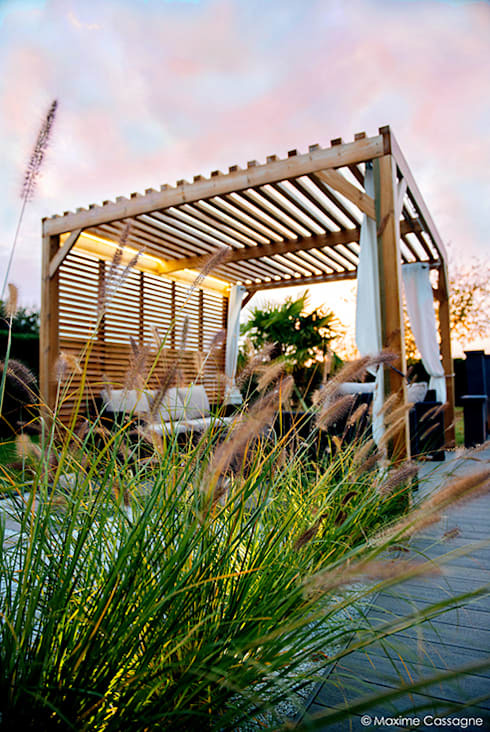 homify is here to offer you some simple and aesthetic tips to help you make your choice of decorative elements to give life to your outdoors! The outdoor courtyard is a place in the house that needs to be as welcoming as possible. This small and friendly space can be both your relaxation area and a place to receive guests. The outer court is a part of the house that can easily be renovated, revamped, or managed. Simple elements can be used to decorate your yard to make it more cheerful, more colourful and particularly suitable for pleasant moments spent outdoors. Well, here is a selection of different decorative elements, furniture and plants, which will inspire you to transform your own backyard! For an attractive exterior, it is important not to forget to add a minimum amount of colour! Matching the furniture and other decorative elements is essential if you want to create a friendly and sophisticated environment. For a chic outdoor look, warm colours with a more neutral edge is a sure choice, as we can see in the image with the dark grey and red. 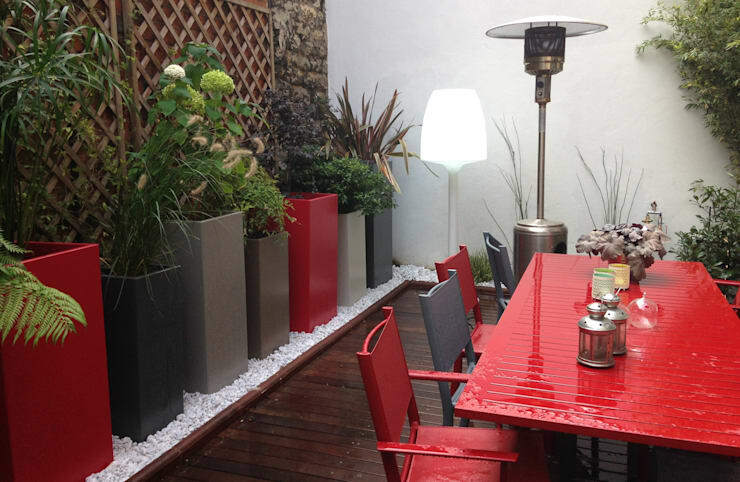 Modern pot plants were selected from a relatively sober red and various shades of grey. The table, meanwhile, is a red that's a little clearer and brighter, bringing more joy to this relaxed area. This is a very nice package that will land perfectly on a terrace or courtyard. Depending on the size of your yard, various options may be appropriate. You will have to fit the size and style of your furniture to the size of your courtyard space. 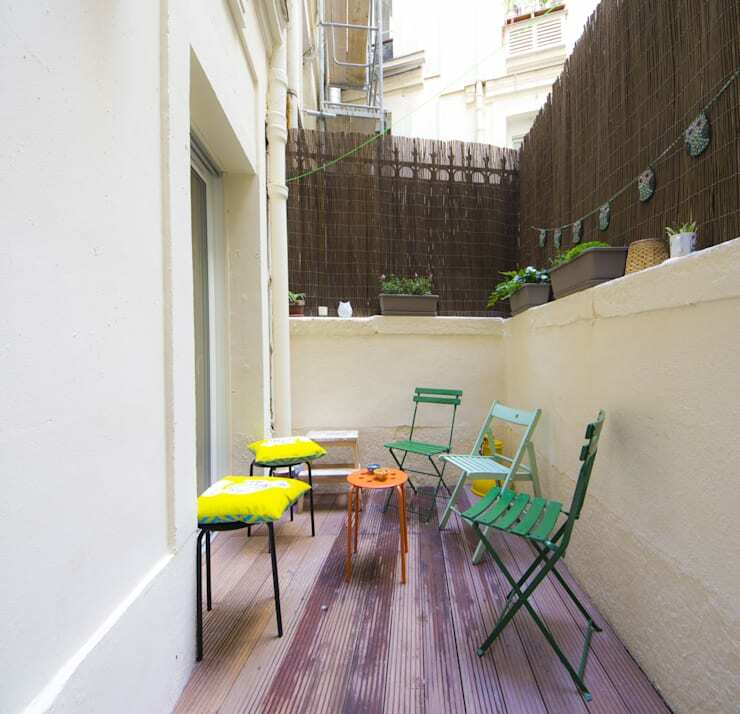 In a small outdoor courtyard, like the one pictured here, it will be wise to opt for simple and minimalist furniture in order to make best use of the available space. We have here a lovely and free enclosed outdoor space, simply arranged with furniture, which enables a functional use of space. Folding chairs and stools decorated with cushions provide just the right amount of seating while not taking up too much space. To overcome the simplicity of this courtyard, bright colours were used, which makes the place more special and friendly. This trick can just as well be used for a small balcony! Have a little more space in your outdoor courtyard? Well then you can allow yourself to use larger and certainly more comfortable furniture than those reserved for small spaces. If you also have a covered area, you can install a small outside seating space which will allow you to get comfortable, as well as create a multifunctional area that will add more class to the courtyard, a little like the lounges and terraces of chic bars. This courtyard with a wooden deck is rather luxurious and welcomes the compact sofas, which double as storage boxes. The coloured cushions agree very well with the wood and creates a sober and relaxing atmosphere. A perfect modern courtyard! There's nothing like plants to make a more consistent and attractive exterior! In a small courtyard, it is preferred to use potted plants that will let you organise your space and it simply requires a little maintenance. Again, choose the size of your pot according to the size of your yard. 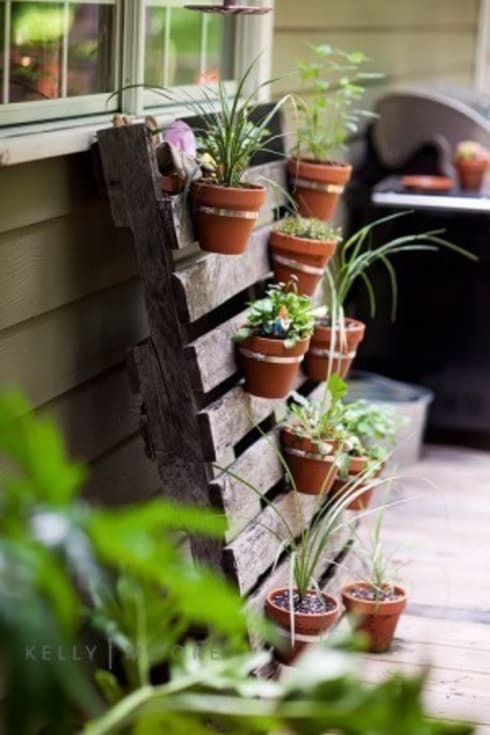 In a small courtyard, these petite pots attached to a re-purposed pallet will brighten the space. A perfect solution if you like to do things yourself! 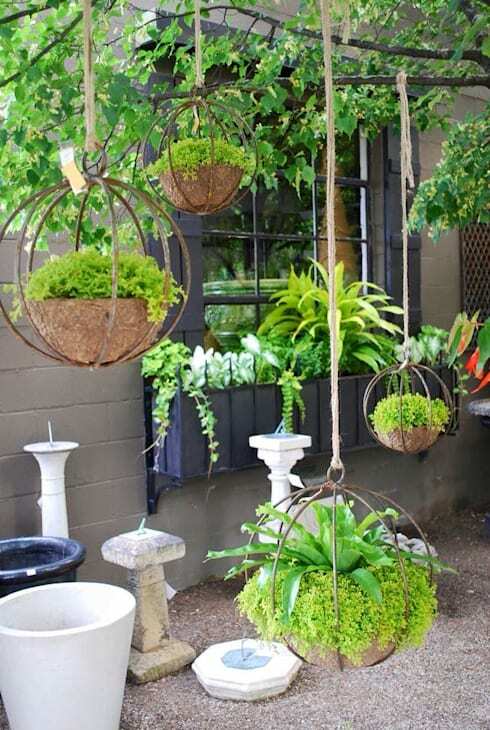 These suspended plants are a little more sophisticated and will be more appropriate for a more spacious and classical courtyard with a whimsical look. They will create a lush environment and provide a warm greeting for all of your guests! To brighten up a yard, there's nothing better than an original lighting source that will impress your guests while making your exterior more special! To this end, these small cubes will be quite useful. Their modern form and resplendent white will brighten your evenings and make your yard more attractive, both in daytime with its colour, and in the evenings when lit. 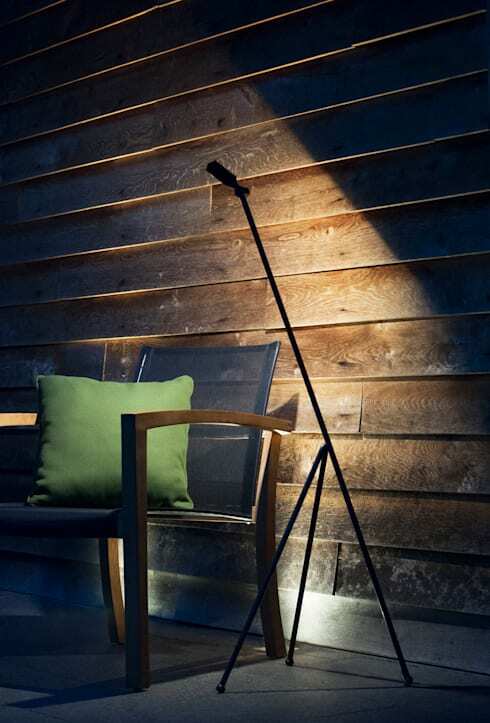 This minimalist lighting will satisfy those who like simple and refined décor. 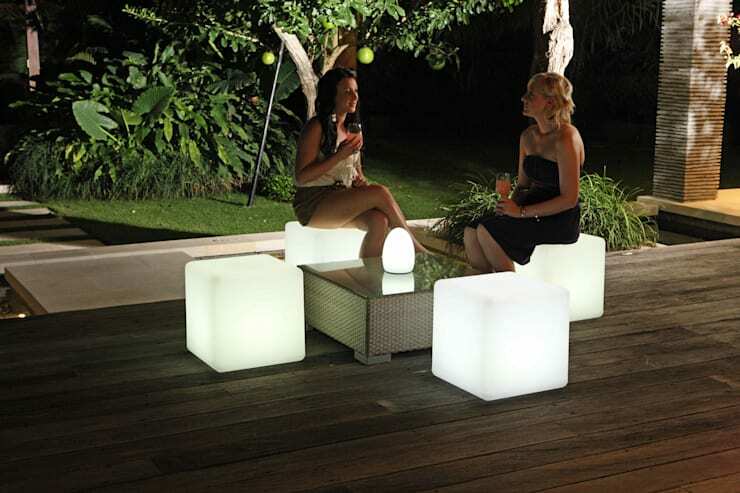 Outside, this lamp will illuminate your yard to be sophisticated and unobtrusive. This is a simple accessory that can transform your outdoors with ease! 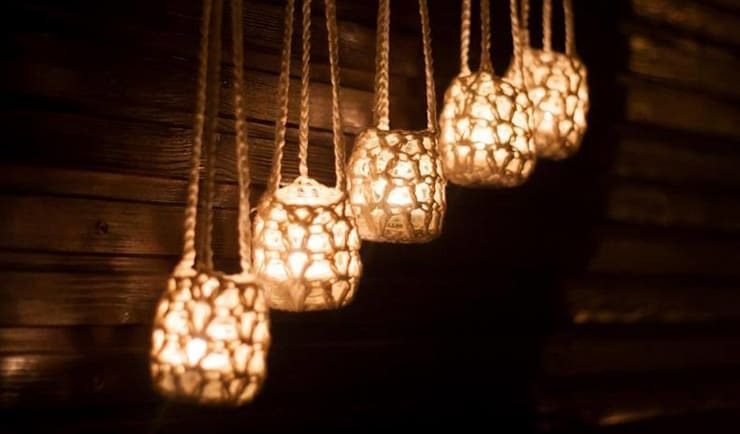 Another original model: these candles suspended in the little crochet holders are very cute! A very unusual and aesthetic alternative that will make any outdoor courtyard more attractive and unusual. For a more layered and welcoming space, feel free to make up your outdoor courtyard with decorative accessories and furniture of all kinds. 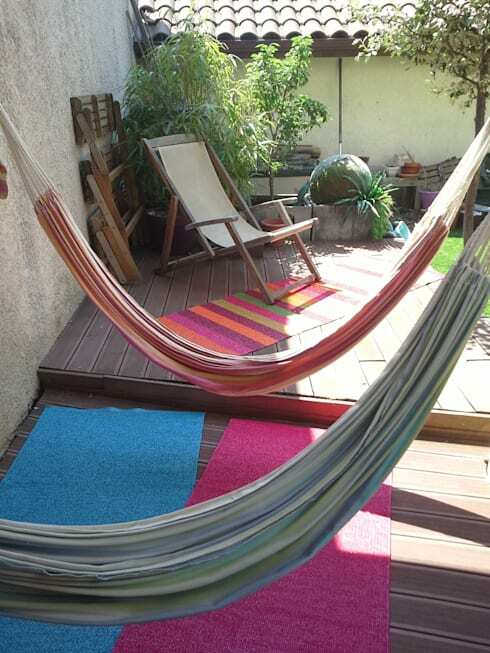 Hammocks form both a relaxed area and contribute to the colour input. Rugs can also bring more joy and festive elements that can easily turn the yard around without asking too much investment! Adding different types of furniture will be a good option, such as, mixing traditional chairs and folding ones. A classic part of any traditional garden, the trellis may still be installed in different types of exteriors, even in the most modern. Its advantage: it sets the space accurately and makes for an intimate courtyard. In addition, trellis can be easily planted in the ground. In this example, the lattice acts as a wall and delimits the courtyard. For more inspiration, have a look at: The Best Garden Privacy Options. In this example, which is most modern, the lattice creates a kind of cage or room outside, which can be very convenient. The trellis is therefore used to define a space, but can also be very useful when it comes to hanging plants or light decorative elements. Will you be using any of these ideas to improve your courtyard? Do you have any other good ideas we missed? Let us know!